Waking up is everyone’s first task of the day and it becomes tough to wake up at a fixed time each day without having a good alarm. You need an alarm that doesn’t shake you up from your sleep and make you feel dizzy and have a lazy day ahead, instead it should make the waking up process easier for you. Today, we bring you the best alarm clock Apps for iPad that will help you make a smooth transition from sleeping to waking up without much stress. 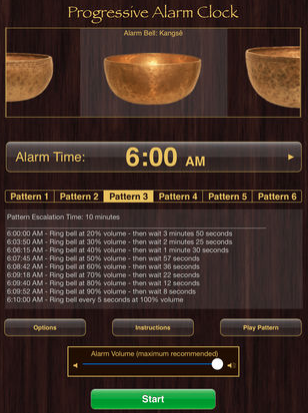 This is a unique alarm which wakes you up using the sounds of Tibetan Bowls. You can customise the sounds according to your liking as there are many patterns of the sounds on offer. The alarm works by gradually ringing slowly and increasing in volume with time. So waking up would be really smooth listening to these calming sounds . The overall design of the App is clear and simple and you can quickly change the settings for the alarm as per your requirement. The App is priced at $1.99 and you can download it from the App Store. This alarm will shut down only when you get up from the bed and be in motion for 30 seconds. This is suitable for people who don’t want to waste time getting up or oversleep in the mornings. Not only will it help you wake up from your bed faster, but will also fire your brain cells immediately. The motion detection feature in this App makes it very different from the usual alarm Apps and the interface is not that bad either with loads of options to customise your settings with different colour schemes. The App is free to download from the App Store. Puzzle alarm clock is for people who take the idea of waking up seriously and help them do it on time each day. You won’t have a chance to hit the snooze button and go back to sleep, all thanks to solving puzzles to shut the alarm off. This is very similar to the motion alarm clock, just that you have to solve puzzles here within a couple of minutes which will make sure you have lost your sleep until you finished with the puzzle. 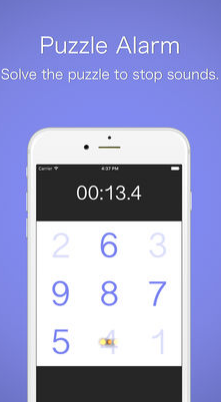 There are variety of puzzles that you can play and you can even setup multiple alarms. 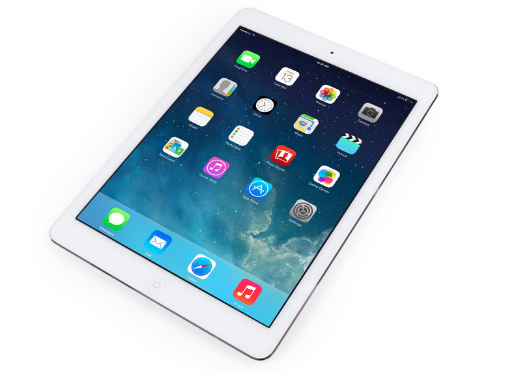 It’s one of the most simplest alarm clocks you can find for your iPad. 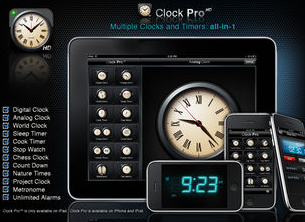 The App includes variety of clocks such as digital clock, analog clock, world clock, chess clock, and project clock. It also supports the feature for background alarms, where the alarm will run for 30 seconds before turning of. Apart from the alarm, there are timer for you to use such as a sleep timer, cooking timer, and a count down timer/clock. The App is loaded with many good features compared to a normal alarm App and the interface looks great. This App is priced at $2.99 and you can download it from the App Store. Sleep Cycle Alarm Clock makes use of your sleep cycles to help you wake up energized and refreshed each day. Once you setup the alarm before going to bed, it detects your sleep patterns and motions and wakes you up in your light sleep the next morning. This ensures the waking up process to be very natural and calming. You feel energetic through the day and sleep better with each passing day. 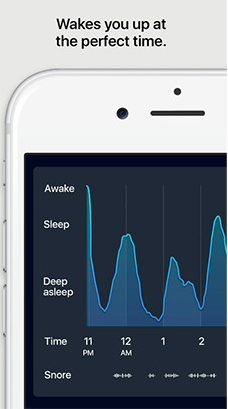 You can check your daily progress on the App and also view the sleep analysis information right at your fingertips.